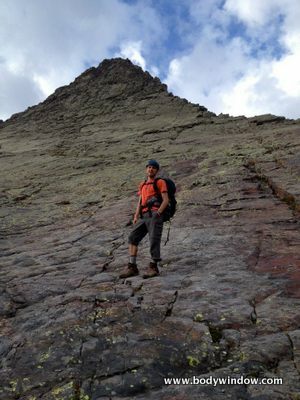 Deep in the heart of the Colorado mountains, we went mountain climbing on Vestal Peak a centennial thirteener at 13,864 feet. 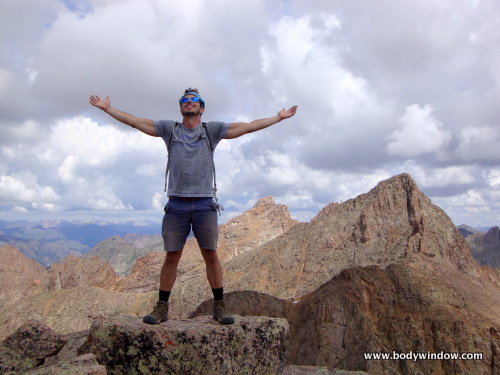 Mountaineering always teaches me something about myself, and this trip was no exception. "Mountains have a way of dealing with overconfidence." 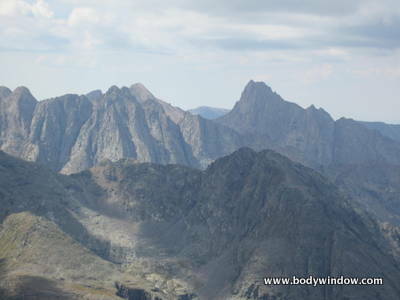 The Weminuche Wilderness, deep in the San Juan mountains, is a pristine and protected wilderness area. 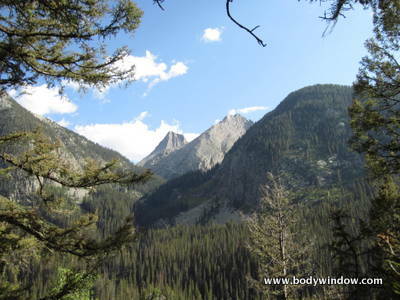 Vestal Peak is deep within this wilderness and approachable only by a very long hike into the Vestal Basin, or by the Durango and Silverton railway. 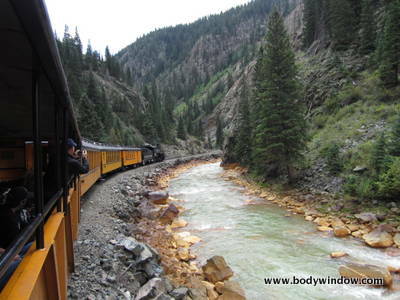 This railway is a popular, scenic and historic, narrow gauge railway that runs through a cut in the Colorado mountains along the Animas River. 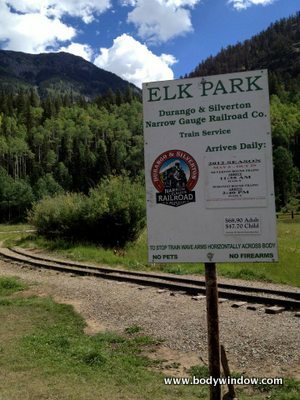 On Labor Day weekend, of 2012, my husband and I, his son and girlfriend opted to take the Durango and Silverton railway to drop us off at Elk Park. While this was the expensive option, we chose it to ease the strain on our aging legs and backs. Our trip was a 4 day epic adventure that started with a six-and-a-half-hour drive from Denver to Silverton, on Friday morning of the long weekend. We boarded the train in Silverton at 2:15 p.m., where a kind tourist from Oklahoma took a picture of us: Alex, my stepson, Chelsie, his friend, Rich, my husband and I. Our trip was short, only 25 minutes by train, but the railway charged us for the seat for the entire three-and-a-half hour route! At this writing, the total fee was about 97.00$ - 87.00 for the ride and 10.00 for checking the backpacks! We arrived in Elk Park the first backpacker stop on the route around 2:45 p.m.
We left the comfort of the train and civilization, with only the packs on our back and headed up the spur trail to the Colorado Trail, known as the Elk Creek trail for this section. 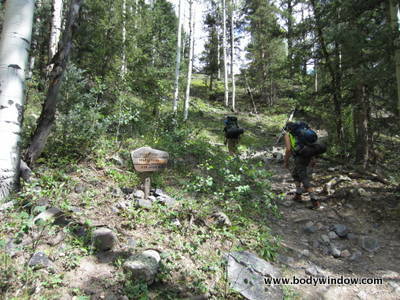 The weather was wonderful, the forest was lush and the trail very easy to find. 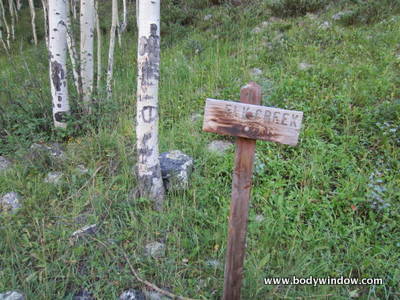 The Colorado Trail is sign-posted where the Elk Creek spur trail meets the main trail. 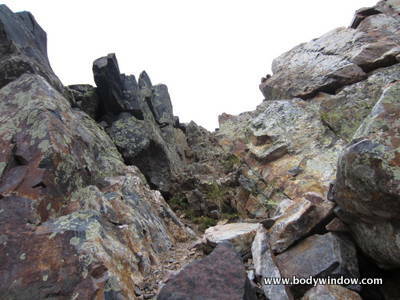 There is a sign-in here, after entering the Weminuche Wilderness. Route finding was easy on these well established trails. 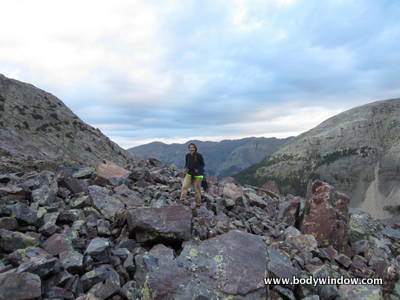 The Elk Creek trail had its ups and downs, but nothing really difficult. The trail climbs steadily and easily along beautiful views of Elk Creek and after a few miles we catch our first glimpse of Vestal and Arrow Peaks. We had climbed the trail for almost 3 miles when we finally approached some prominent beaver ponds at the junction of the Elk Creek trail and the Vestal Creek trail. 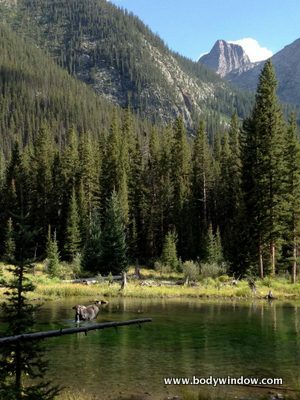 These ponds are described by Gerry Roach in his 13'er guide. We were thrilled at how quickly we reached this landmark, about one-and-a-half hours later, around 4:15 p.m. The Vestal Creek Trail leaves the Elk Creek Trail on the East end of the beaver ponds. My GPS read 9,990 feet. Roach was right on. We were lucky enough to spot a moose, who seemed unafraid of people. She munched on algae from the bottom of the pond, barely looking up to pay any attention to us. There are some lovely camping spots here, if you do not wish to climb higher. We still had several hours of daylight left, so we pushed on for the Vestal Basin. 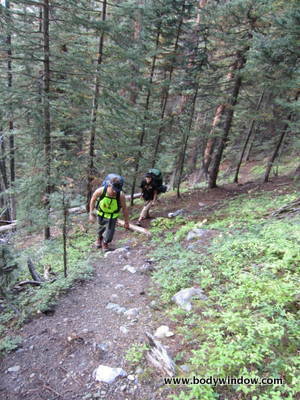 After leaving the comfort of the Elk Creek trail, the way got much rougher and the trail got really quite steep. We were all happy that it wasn't raining. 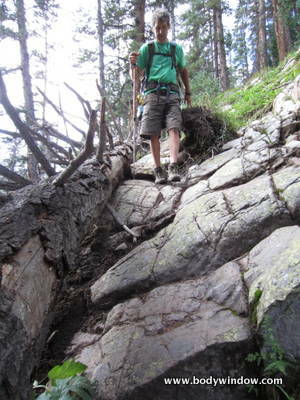 The Vestal Creek trail is a climber's use trail, so it can be difficult with a loaded pack. We did get lost in some dead fall and found a lower trail that followed close to Vestal Creek that was much worse than the upper, more easterly Vestal Basin trail. We finally realized we were on the harder trail when I decided to bushwack to what appeared to be an easier way, and lo and behold, the upper trail re-appeared! We were relieved, since the backpacks were getting quite heavy with the jumping over fallen trees and hopping from rock to rock. Another two-and-a-half to three miles of this steep climbing finally placed us in the lower meadow of the Vestal Creek Basin, where we would camp for the night. My GPS said we were finally at 11,400 feet after a total of 6 miles. Wandering around in the dead fall on the Vestal Creek trail, and looking for an appropriate campsite, most likely added an extra one-half mile. It was just after 7 p.m. and we had barely reached our destination before dark. All in all it took us four-and-a-half hours to climb up from Elk Park to the lower meadow in Vestal Creek, a total of 6 miles and 2600 vertical feet. The morning of the second day we arose early as we always do when we are mountain climbing and found the junction of the Vestal Creek trail and the climbers trail to the peaks. 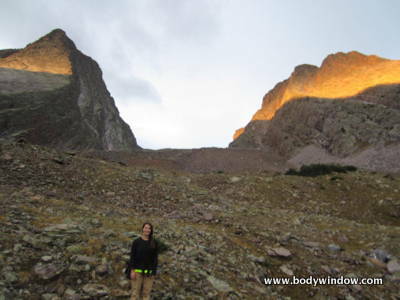 We began the steep climb up into the Upper Vestal Basin at approximately 6:30 a.m. We were lucky enough to see the top of Vestal Peak and Arrow peak in the alpenglow of the early morning light. Here is where we separated ways, Rich and Alex to climb Wham Ridge and Chelsie and I to take the non-technical South Face route. The picture below shows Rich and Alex making their way up to the slabs at the base of Wham Ridge. For some reason, the guys didn't take many pictures while on Wham Ridge. This is only one of the two that I was able to get from Alex, at the start of their climb at the base. 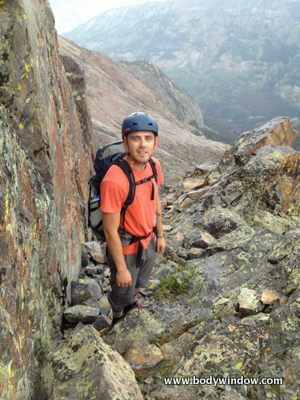 I cannot vouch for the fact that they climbed Wham Ridge, except for this single picture of Alex. They told me they did the entire route without ropes or gear of any kind. This is Alex after they completed the crux. They were packing all the necessary gear, just never felt like they had to use it. 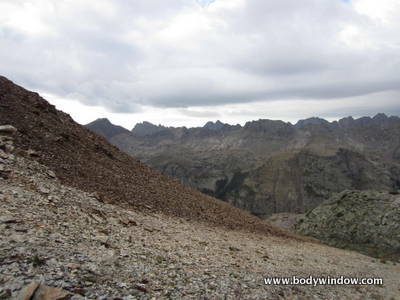 I was told they did this, because the sky was iffy, and this I know as we ladies climbed the South Face route. I didn't know whether to be happy with this, or upset. Fortunately, when they told me, the route had already been completed. 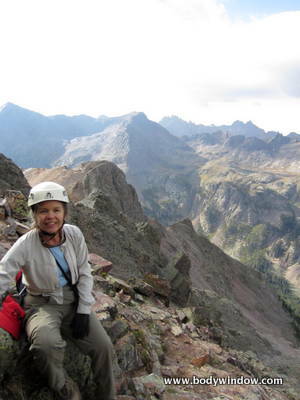 The rest of the story will focus on the ladies mountaineering adventure on the South Face route. 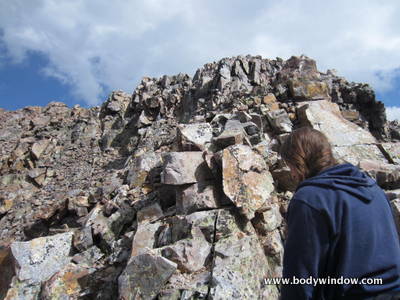 Chelsie and I quickly climbed south on the boulder ledges to the West of Vestal peak. Lots of rock hoping but not a lot of elevation gain in this section. We looked up towards the saddle between Vestal and Arrow. 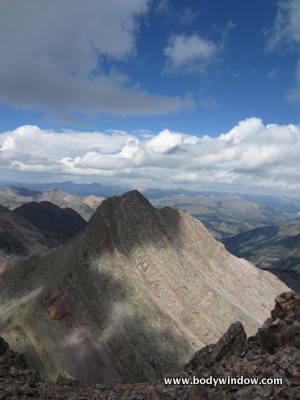 The lightly colored scree field near the top has apparently humbled the best of mountaineering trips. 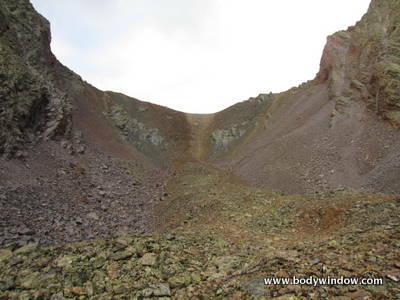 This appeared to me to be nothing harder than scree fields I have done on many a route in the Colorado Mountains. 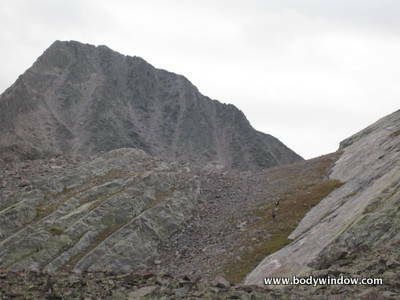 We quickly approached this scree field to the saddle, infamously known as the "Dues Collector Couloir." 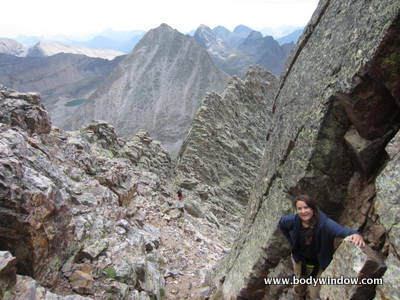 Much to do is made about this couloir, but even Chelsie, a novice mountaineer made quick work of it. She just put her head down, and scrambled up on her strong legs. All-in-all it only took us about 20 minutes to get past this obstacle. Not too bad. 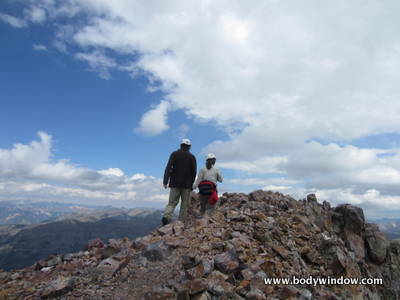 At the top of the saddle, at 12,680 feet we stopped to catch our breath as we looked out to the south. 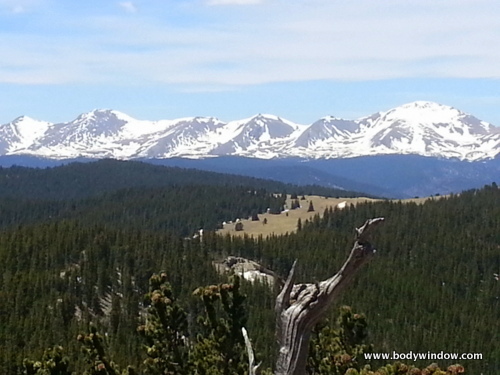 With expansive views like this, we knew why we loved mountaineering in the Colorado mountains! From here the trail turned East, and we began a rocky ascending traverse, looking for the prominent south-face gully that Gerry Roach describes. The route was cairned, but not quite enough for us. Somehow, I managed to lose my way. I blame it on the faulty description in the Roach book, which I had copied and had the description with me. Because I was afraid to climb too far, too fast, I descended too low. I believe if Roach's route description had said to ascend on the traverse, all the way to the top of prominent gully, I would have gotten it right. Instead, we tried to climb up just to the West of the gully and missed the cairn leading into the gully. Perhaps the description is just outdated. Here is a photo of Chelsie after we scrambled too high and knew we had to turn around. A least the views were phenomenal! 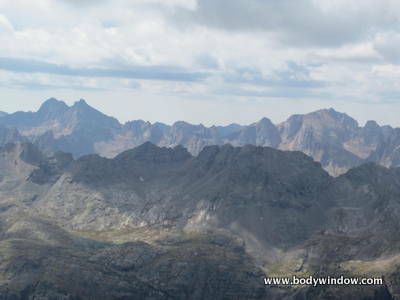 We should have traversed to the ridge below us (in the left on the picture), and over it into the prominent gully! Added to my woes, Chelsie, who is a novice mountaineer, was eager and kept saying emphatically, "Yes, we can do this," whenever I got stuck on the route finding. While I loved her enthusiasm, I knew this thinking could lead us into trouble. To add to our discouragement, as we were wandering around the south face looking for the route up, we heard the whooping of Rich and Alex as they reached the summit! Dasterdly! Finally we just sat at the last cairn we could find, and waited for Rich and Alex to descend. After what felt like forever, they appeared, calling to us, at a ridge to the East of us. What a relief! We had resigned ourselves to being unable to summit that day. We climbed over to them, and they showed us the direction from which they had come. It seemed painfully obvious. I said to Chelsie, "Come on, we can do it. We have plenty of time." 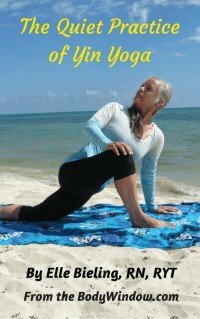 With some encouragement, she decided to press on. The guys honkered down to wait for us. 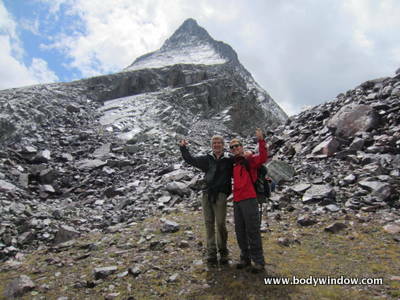 We climbed into the prominent gully, and at the top was the small gully that Roach describes. I could see the shelf at the top to the left, where I was supposed to go, to head west, once we reached this shelf at the top of the ridge. Suddenly, we turned around, and Rich and Alex had ditched their heavy packs and were following us! How sweet was this! And how encouraging! They were going to climb with us to the top! 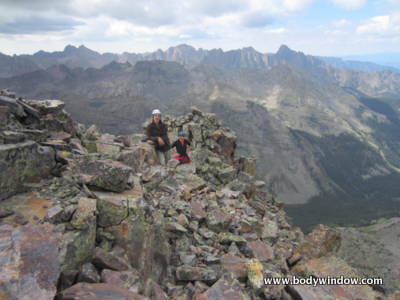 Above the small gully on the high summit ridge, there were a few class 2+ moves, that I would have called class 3. 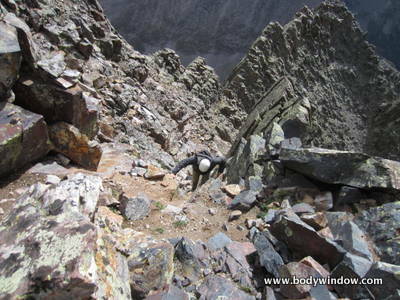 We passed the "notch" that Roach describes, on the way to the final summit pitch. The picture below actually shows us coming down, but I wanted to include this prominent feature for those studying the route. It is the pyramid on the left. While I stopped to snap pictures, Chelsie passed me, and led the way to the top. We are almost there now, on Vestal's final summit ridge. Rich and Alex pose for the amazing view behind us to the South. As is our custom, my husband, Rich and I held hands as we approached the final feet to the summit. It was great to have Alex to record the moment. 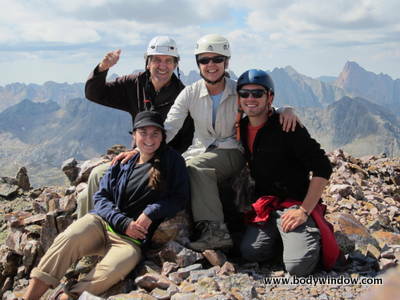 It was very special for me, in spite of the fact that Rich had already been on the summit. I was choked up a bit, because I truly thought I would not make it. Here we all are on the summit! We set up the self-timer on the camera with great success. The view is to the south, with the prominent peak to the right, Pigeon Peak. The weather held out for us and afforded fabulous views of the surrounding Colorado mountains, the San Juans to be specific. To the East was Rio Grande Pyramid and the Window. We had climbed Rio Grande Pyramid about a month prior. To the Southeast, Jagged Peak (left) which Alex, Rich and I climbed the prior year, 2011, on Labor Day weekend. Windom and Sunlight are to the right. 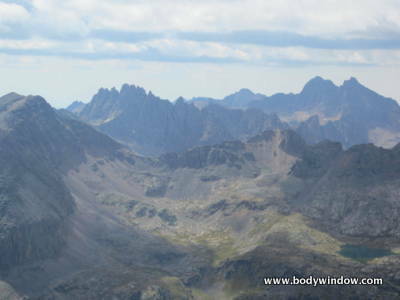 Due south was a full view of Windom Peak, Sunlight (clustered to the left) and Eolus (far right), all fourteeners we had climbed many years ago. To the Southwest, is Turret Peak and Pigeon Peak. 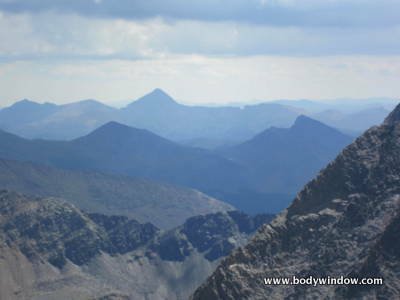 We hope to climb these two peaks in 2013. And, of course, to the West is the ever-present view of Arrow Peak. We were so lucky to have the weather hold out. 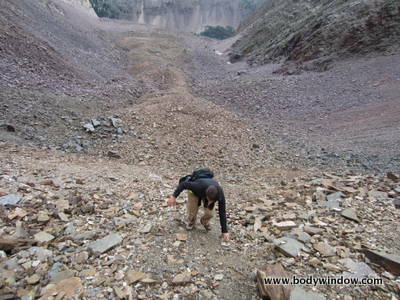 On our descent, I was able to fully asses my mistake in route finding on the way up. I was so near, yet so far. 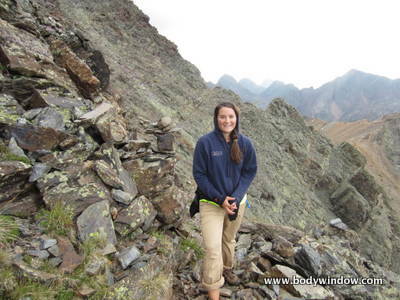 The biggest mountaineering lesson I learned was that I really am not as confident as I might think I am. It was a humbling experience in the plain sight of a novice. I will never climb the Colorado mountains, without my husband again. He is so much stronger than I am, and I know how many jams he has gotten me out of on our prior climbs. As I approach my mid-50's I am ever more aware of my capabilities and do not wish to overestimate them. I no longer have the bravest heart nor the drive that I once did. I will continue mountaineering, with caution, respecting the mountains, as always, and understanding my limitations. 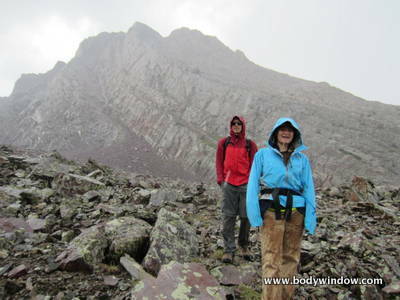 The weather finally gave up and on our long descent, hailed and rained on us, just as we completed the Dues Collector Couloir. Before long, the sun came back out as we descended to the base of Wham Ridge. I was so proud of Rich and Alex, and had to shoot a picture of them, with the glistening ridge behind them! 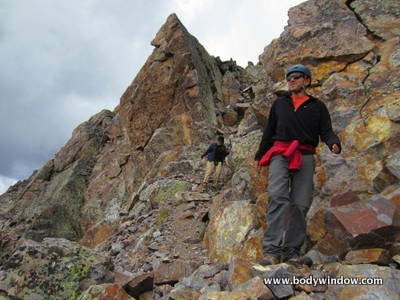 All told, it took the guys only 2 hours to climb from the base of Wham Ridge at 12,200 feet to the summit at 13,864 feet. It took we girls 5 hours, with the wandering and the waiting. It only took 2 hours to descend back to our camp in the Lower Vestal Basin. The total round trip mileage for the South Face Route was 5 miles. The third day in the wilderness, we decided to hang out and fish and relax in the morning. We broke camp in the afternoon and descended the steep Vestal Trail, in the rain, slipping and sliding back to the beaver ponds and the confluence of the Elk Trail. 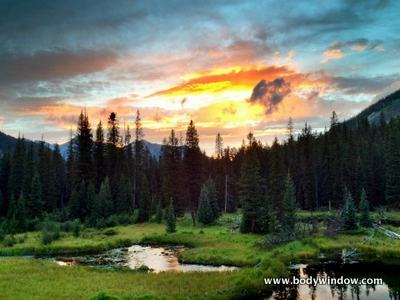 We enjoyed a lovely sunset at our low camp, and a clear evening also awaited us. Again the moose came out to feed to grace our sunset. 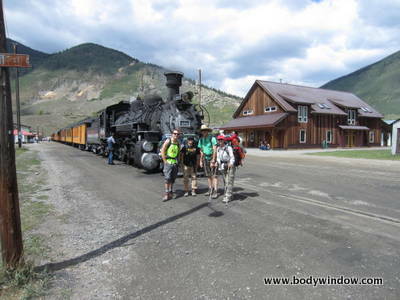 On the final morning, we hiked out the final 3 miles to Elk Park, boarded the Durango and Silverton railway for the short trip to Silverton. After a big meal in Ouray, we retraced our long car ride, back to Denver and our normal lives. What a glorious trip of healing of my heart, my body, mind and soul!